One of the most impressive motherboard designs coming out of Computex was MSI’s new X399 Creation motherboard. With Threadripper 2 around the corner, sporting support for up to 32 cores and 250W TDP, a couple of the motherboard manufacturers are building X399 ‘refresh’ motherboards that are optimized for the new processors, and this is MSI’s very impressive effort. The headline from this motherboard is the 19 power phases, arranged as 16 for the processor. 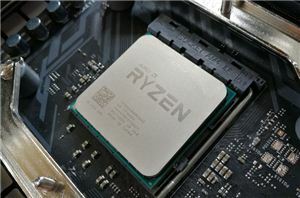 This is likely a four-phase implementation with two doublers, but still comes in as eight more than the amount of phases for the CPU compared to any other Threadripper motherboard on the market. The effect of using more phases in this way means that the power multiplexing over time that occurs between phases gives each phase less time being the primary phase, as well as splitting the delivery with other segments, reducing the overall load and allowing for more headroom and/or better longevity. The power delivery is also sided with two 8-pin EPS 12V connectors. The reason why most motherboard manufacturers only use eight is because the socket and memory design is bulky: ultimately there is only enough space for six phases, or eight if a smaller choke design is used. In order to fit sixteen, MSI has had to push the socket and memory down, forcing the manufacturer to choose to either lose one of the PCIe slots, or extend the board vertically (they seem to have done the latter). But this also gives the manufacturer a larger choice for phases and chokes with fewer space constraints, if a good enough power delivery heatsink is also applied. In these cases it sometimes requires more PCB layers to help with power/ground and routing, and MSI is using eight which is a high number for a consumer motherboard (usually 4-8, rarely 10), but not the highest (and server/workstation boards often use from 6 to 12 depending on the feature set). On the board MSI is using a dual power delivery heatsink design, connecting the main power delivery heatsink by a heatpipe to a heatsink next to the rear panel that also helps to cool all the networking options. One thing to note is the styling on the heatsink and the board: it is very angled, and my feedback to MSI is that the board looks very busy. This is going to be MSI’s halo Threadripper 2 motherboard, and to be honest, the styling needs a good amount of work. 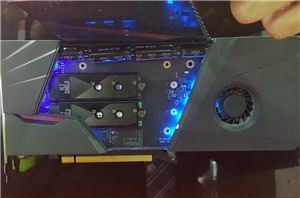 For a Halo motherboard, MSI is supporting four PCIe slots from the processor, although without water cooling only 3-way is going to be used due to PCIe slot spacing. Between the slots is an M.2 PCIe 3.0 x4 slot, with another slot actually next to the DRAM slots, as the board is also extended in width as well (making it E-ATX). MSI will be bundling its Quad M.2 PCIe 3.0 x16 card when the board is sold, giving a total of six M.2 slots. MSI says that it supports seven M.2 total, although the last one does not seem to be obvious, so it could be on the rear of the motherboard. There is no U.2 slot, as it seems that the form factor is basically dead for the consumer market. 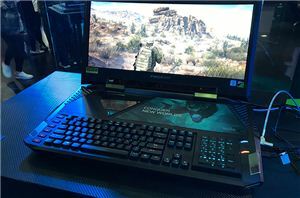 For controllers, MSI has equipped the X399 Creation with dual Intel gigabit Ethernet ports, and an Intel 802.11ac Wi-Fi. For a halo motherboard I was expecting to see Aquantia’s 5G or 10G controller, however we do not get that here. There is no Thunderbolt either, but there are four USB 3.1 (10 Gbps) ports on the rear (one Type-C), and at least eight USB 3.0 ports, four or six of which on the back panel and two onboard headers for cases. There is also a Type-C onboard header, but it is not obvious if this is USB 3.0 or USB 3.1. Audio will be with an upgraded Realtek ALC1220 codec solution, with PCB separation between digital and analog signals and additional filter caps. One of the features that MSI was keen to promote is that the board supports 10 fan headers in PWM mode but also three user-positioned thermal sensors that will be bundled in the box. This will allow users to define their thermal environment, with the software, how they need to. We expect the MSI X399 Creation (or is it MSI MEG Creation?) to come to the market sometime soon, before the launch of Threadripper 2, or perhaps the same day as a launch partner with the processor. We expect a high price, although the lack of something like a 10G NIC will mean it won’t be super high. "In order to fit sixteen, MSI has had to push the socket and memory down, forcing the manufacturer to choose to either lose one of the PCIe slots, or extend the board vertically (they seem to have done the latter)."